Decorative vintage shabby chic style metal brushed cream scroll hearts napkin holder. Four Metal Corner Legs/Stands. Height = 8cm (3.2″) approx’. 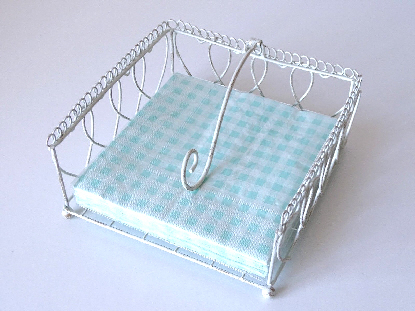 Size: 18cm x 18cm Square (7″ x 7″) approx’ To Fit ‘Smaller’ Napkins. To view this item in more detail please follow this eBay link. Thank you.